And the 18-year-old Elsa Iradukunda is Miss Rwanda 2017. Iradukunda held hands with the First Runner-Up Shimwa Guelda before the judges announced the winner. The two looked each other in the eyes, smiling but with anxiety and panic temporarily taking toll on them. “We will only announce the winner,” said chief judge Mike Karangwa, before proceeding to declare Iradukunda as the pageant for 2017. They hugged, and cried. Iradukunda continued sobbing in the crown’s chair until she left the stage later to go receive her brand new Suzuki SX4 presented by the main sponsor of the competition, Cogebank. “What was your secret for winning this contest?” asked the presenter immediately after Iradukunda sat to be crowned by the outgoing Miss Jolly Mutesi, whom many claim near resemblance with her successor. And that was her punch line. Period. She gave no more account afterwards. Miss Iradukunda’s response was genuine. Deeply revealing. Certainly, all girls prayed very hard. Miss Popularity, the theatrical ‘Igisabo’ Honorine Hirwa, who will never be forgotten for having bragged about her heavyweight “booty” as a symbol of a true ‘Rwandan pageant’, has a video circulating on social media showing her ‘crying a river ‘ while preaching the word of God to her colleagues in the boot camp. If indeed it wasn’t for prayers, and arguably the ‘beauty’ card, little, if any at all, was there to claim, going by the theme for the contest: “Brain, Beauty and Culture’. And that is how Iradukunda won the ‘heated’ contest. Prayers, and prayers. That’s it. After all, the Rwf15 million car and the Rwf800, 000 monthly stipend, not to mention the freebies, the publicity and the privileges that come along with the tittle, are worth a vigorous prayer. 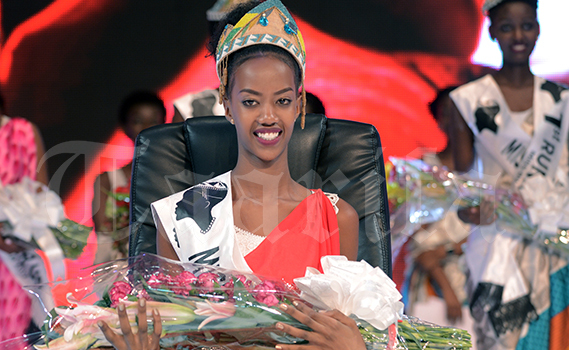 Mentioning that most, if not all, of the contestants come from poor families, might be considered demeaning, but the fact of the matter is that the package that comes with the crown is huge for the average Rwandan family. Not only do families and relatives invest to support and pray for their daughters, friends and fans go the extra mile to vote and cheer up when the contestant is up presenting. As for the judges, the public court was no easy on them, but the monumental chief judge, the one and only one, Mike Karangwa, made it clear what the benchmarks were. Karangwa, not only having displayed the lack of ability to raise superior queries, same with his entire panel, gave the following criteria: beauty, carrying 30 points, illustration with 30 points, and 40 points for content. Luckily enough, the panel of judges had no teacher. An F was hanging over their heads. Save for the contestants’ gifted beauty and elegance, which the majority had, fairly speaking, the other yardsticks were squandered live on the stage. The Minister of Sports and Culture and the Minister of Education were saved from the embarrassment this time around as they were attending the 14th National Leadership Retreat. Undeniably, contestants were prepared only that they took a few days to undergo the vigorous drills to learn the Catwalk and cram answers for questions on and vague cultural literacy and humongous political economy, otherwise, the rest was left for the nation to be baffled. The girls were subjected to unnecessary humiliation. But they displayed great temperament, confidence and steadiness. They all presented projects quiet similar to cabinet ministers’ policy papers. Some sort of advocacy, but largely copies of policies too big for them to handle to the point where two judges questioned their feasibility, such as empowering house maids across the country with managerial skills of their monthly income, job creation among the youth than being job seekers (even government has struggled with it), maternal health through campaigns to raise awareness and many more complex projects. They fought hard, spoke confidently and pocketed their feelings until they left the stage, even when it was discomforting, one after the other, with judges asking vague and unbearable questions. At one point one of the judges asked an ambiguous question and was hit hard with a vague answer at a terrific speed and ended up requesting the contestant twice to slow down and repeat her answer. He barely understood the answer nevertheless. And the drama proceeded. Contestants are equally intelligent, but the lack of general knowledge and the inability to speak English fluently and to defend their arguments with facts subjected the girls to pejorative and harsh judgment. Language proficiency has now become a recurring subject in every episode of the competition, much as contestants were not as bad as those of 2016 and the previous years. What was obvious though, is that the girls were not given a chance to remain who they are and be asked spontaneous questions to judge their IQ and their ability to express themselves naturally. Some of them forgot words or lines from the script they were given. Had there been a slight twist in the questions, poor girls would have been crucified on the public cross. Clearly even the judges seemed to have been instructed not to cross a certain line of thinking. It all was about projects, projects and projects and projects, well and ‘agaciro” (dignity) and Indangagaciro z’ Umuco Nyarwanda (Rwandan Values), so obscure, nearly irrelevant and off topic, going by the theme. The dances were epic, not for the annoying DJ who is probably hiding before the organisers hold him by the neck for spoiling the night. Inganzo Ngari entertained, not to their usual quality but the performance was quite thrilling. Fashion flopped. Well, not entirely. Clothing, footwear, accessories, makeup, and the crown’s chair were a complete joke. Expectations were high, as fashion designers were expected to go rouge and distinctively display their supremacy, why not; it is an era of Made In Rwanda, of which one of the contestants presented a project about. Dressing was casual, basic, and nothing stunning or of a pageants’ caliber. 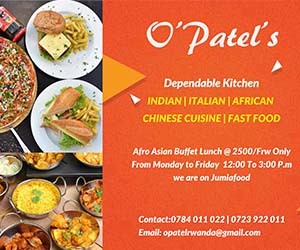 The Kabash Fashion House, Ian Boutique, and Sonia Mugabo may not get such an opportunity any time soon. For some reason, the traditional attire saved the night. The choice of colors and material was on point, barely any regret. But it ended well with Mahatma Gandhi University stealing the show. The Vice Chancellor, Vince Sinining, dashed on the stage and nailed it, offering a free-full scholarship to all the 15 finalists. The girls have potential. A free university education, which many wouldn’t have afforded, is obviously a prize that will unlock their potential and propel them to greater heights. As for the other brands, they simply goofed and they dont deserve to be mentioned for this publication’s sanity’s sake. Queen Kalimpinya will embark on maternal health through campaigns to raise awareness about it. The rest of the event is on social media and in the images below as presented by PACIFIC HIMBAZA & NICOLAS KIZZA.